This article is about the city in Canada. For the capital of the United Kingdom, see London. 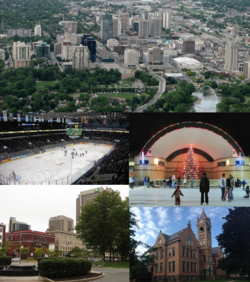 London is a city in Southwestern Ontario, Canada along the Quebec City–Windsor Corridor. The city has a population of 383,822 according to the 2016 Canadian census. London is at the confluence of the Thames River, approximately 200 kilometres (120 mi) from both Toronto, Ontario and Detroit, Michigan; and about 230 kilometres (140 mi) from Buffalo, New York. The City of London is a separated municipality, politically separate from Middlesex County, though it remains the county seat. The population in 1846 was 3,500. Brick buildings included a jail and court house, and a large barracks had also been built. London had a fire company, a theatre, a large Gothic church, nine other churches or chapels, and two market buildings. In 1844, a fire destroyed 150 buildings but most had been rebuilt by 1846. Connection with other communities was by road; stages ran daily. A weekly newspaper was published; the post office received mail daily. Records from 1869 indicate a population of about 18,000 served by three newspapers, churches of all major denominations and offices of all the major banks. Industry included several tanneries, oil refineries and foundries, four flour mills, the Labatt Brewing Company and the Carling brewery in addition to other manufacturing. Both the Great Western and Grand Trunk railways had stops here. The Crystal Palace Barracks, built in 1861, an octagonal brick building with eight doors and forty-eight windows, was used for events such the Provincial Agricultural Fair of Canada West held in London that year and visited by Prince Arthur, Duke of Connaught and Strathearn, Governor-General John Young, 1st Baron Lisgar and Prime Minister Sir John A. Macdonald. Several insurance companies had offices in the city. London has a humid continental climate (Köppen Dfb), though due to its downwind location relative to Lake Huron and elevation changes across the city, it is virtually on the Dfa/Dfb (hot summer) boundary favouring the former climate zone to the southwest of the confluence of the South and North Thames Rivers, and the latter zone to the northeast (including the airport). Because of its location in the continent, London experiences large seasonal contrast, tempered to a point by the surrounding Great Lakes. The summers are usually warm to hot and humid, with a July average of Template:Cvt, and temperatures above Template:Cvt occur on average 10 days per year. In 2016, however, temperatures at or above Template:Cvt occurred more than 35 times. The city is affected by frequent thunderstorms due to hot, humid summer weather, as well as the convergence of breezes originating from Lake Huron and Lake Erie. The same convergence zone is responsible for spawning funnel clouds and the occasional tornado. London is in Canada's Tornado Alley. Spring and autumn in between are not long, and winters are cold but witness frequent thaws. Annual precipitation averages Template:Cvt. Its winter snowfall totals are heavy, averaging about Template:Cvt per year, although the localized nature of snow squalls means the total can vary widely from year to year. The majority of snow accumulation comes from lake effect snow and snow squalls originating from Lake Huron, some Template:Cvt to the northwest, which occurs when strong, cold winds blow from that direction. From 5 December 2010, to 9 December 2010, London experienced record snowfall when up to 2 m (79 in) of snow fell in parts of the city. Schools and businesses were closed for three days and bus service was cancelled after the second day of snow. The skyline of London, Ontario as of July 25, 2017. London Ontario Downtown overlooking Victoria Park from the City Hall observation deck. London's performance venues include Aeolian Hall, a former Victorian-era town hall in Old East Village, and the London Music Hall, a multi-level performance space in the downtown's Entertainment & Culture District. Guy Lombardo, an internationally acclaimed big band leader, was born in London, as was jazz musician Rob McConnell. Contemporary musicians born in London include hip hop artist and former CBC Radio host, Shad, and singer-songwriter Meaghan Smith. Justin Bieber was born in London prior to moving to Stratford, Ontario. The city is home to several museums, including Museum London, which is at the Forks of the Thames. Museum London exhibits art by a wide variety of local, regional and national artists. London is also home to the Museum of Ontario Archaeology, owned by Western University. Its main feature is Canada's only on-going excavation and partial reconstruction of a prehistoric village of the Neutral Nation (Lawson Site). The Royal Canadian Regiment Museum is a military museum at Wolseley Barracks, a Canadian former Forces Base in the city's Carling neighbourhood. The Secrets of Radar Museum was opened at Parkwood Hospital in 2003, and tells the story of the more than 6,000 Canadian World War II veterans who were recruited into a top-secret project during World War II involving radar. The London Regional Children's Museum in South London provides hands-on learning experiences for children and was one of the first children's museums established in Canada. The Canadian Medical Hall of Fame has its headquarters in downtown London and features a medical history museum. London's recent urban regeneration efforts and civic initiatives have allowed the city to rank high in Canadian livability lists. In 2016, MoneySense magazine ranked London as the fourth best large Canadian city to live in. It also ranked fourth (fifteenth overall) in 2013, and fifth in 2015. In 2015, London was ranked as the sixth happiest city in Canada by Jetpac City Guides. The Canadian Centre for Policy Alternatives ranked London as the sixth best place to be a woman in 2015 and third in 2016. London's municipal government is divided among fourteen councillors (one representing each of London's fourteen wards) and the mayor. Matt Brown was elected mayor in the 2014 municipal election, officially taking office on 1 December 2014. Prior to Brown's election, London's most recent elected mayor was Joe Fontana; following Fontana's resignation on 19 June 2014, city councillor Joe Swan served as acting mayor until councillor Joni Baechler was selected as interim mayor 24 June. Until the elections in 2010, there was a Board of Control, consisting of four controllers and the mayor, all elected citywide. In addition to mayor Matt Brown the following were elected in the 2014 municipal election for the 2014-2018 term. The city includes four provincial ridings. In the provincial government, London is represented by Liberal Deb Matthews (London North Centre); Progressive Conservative Jeff Yurek (Elgin—Middlesex—London), and NDPs: Teresa Armstrong (London—Fanshawe) and Peggy Sattler (London West). Urban consolidation is a key strategy for London, helping to curb low-density greenfield expansion and revitalize the downtown, similar to the London Plan in Greater London, England. ^ "London (City) community profile". 2006 Census data. Statistics Canada. Archived from the original on 6 July 2011. http://www12.statcan.gc.ca/census-recensement/2006/dp-pd/prof/92-591/details/page.cfm?Lang=E&Geo1=CSD&Code1=3539036&Geo2=PR&Code2=35&Data=Count&SearchText=London&SearchType=Begins&SearchPR=01&B1=All&Custom=. Retrieved 15 February 2011. ^ "London (Census metropolitan area) community profile". 2006 Census data. Statistics Canada. Archived from the original on 6 July 2011. http://www12.statcan.gc.ca/census-recensement/2006/dp-pd/prof/92-591/details/page.cfm?Lang=E&Geo1=CMA&Code1=555&Geo2=PR&Code2=35&Data=Count&SearchText=London&SearchType=Begins&SearchPR=01&B1=All&Custom=. Retrieved 15 February 2011. ^ "London (City) community profile". 2016 Census data. Statistics Canada. Archived from the original on 11 February 2017. http://www12.statcan.gc.ca/census-recensement/2016/dp-pd/prof/details/page.cfm?Lang=E&Geo1=CSD&Code1=3539036&Geo2=CD&Code2=3539&Data=Count&SearchText=London&SearchType=Begins&SearchPR=01&B1=All&TABID=1. Retrieved 8 February 2017. ^ Ellis, Christopher; Deller, D Brian. "An Early Paleo-Indian Site near Parkhill, Ontario". ASC Publications. Archived from the original on 30 September 2007. https://web.archive.org/web/20070930050430/http://www.civilization.ca/cmc/archeo/emercury/159.htm. Retrieved 24 September 2009. ^ a b Max Braithwaite (1967). Canada: wonderland of surprises. Dodd, Mead. Archived from the original on 1 January 2016. https://books.google.com/books?id=2LAEAQAAIAAJ&q=%22named+after+london%22%22London,+Ontario+%22&dq=%22named+after+london%22%22London,+Ontario+%22. ^ a b c d e f g h "The beginnings". City of London. 2009. Archived from the original on 25 November 2010. https://web.archive.org/web/20101125160114/http://london.ca/d.aspx?s=%2FAbout_London%2Flondon_history.htm. Retrieved 24 September 2009. ^ "Reservoir Hill". Ontario Municipal Board. February 2001. p. 40. Archived from the original on 5 February 2009. https://web.archive.org/web/20090205110512/http://ul.london.on.ca/urbanweb/News/News2005/OMBreservoirhill.pdf. Retrieved 24 September 2009. ^ a b "Event Highlights for the City of London 1793–1843". City of London. Archived from the original on 18 December 2010. https://web.archive.org/web/20101218012710/http://london.ca/d.aspx?s=%2FAbout_London%2Ftimeline1-2.htm. Retrieved 24 September 2009. ^ a b c "Event Highlights for the City of London 1844–1894". City of London. Archived from the original on 18 December 2010. https://web.archive.org/web/20101218012858/http://london.ca/d.aspx?s=%2FAbout_London%2Ftimeline3.htm. Retrieved 24 September 2009. ^ Smith, Wm. H. (1846). SMITH'S CANADIAN GAZETTEER - STATISTICAL AND GENERAL INFORMATION RESPECTING ALL PARTS OF THE UPPER PROVINCE, OR CANADA WEST:. Toronto: H. & W. ROWSELL. p. 100. https://archive.org/details/smithscanadianga00smit. ^ "Ontario White Sulphur Springs". The London and Middlesex Historical Society. Archived from the original on 30 October 2008. http://www.londonhistory.org/bath.htm. Retrieved 2 June 2008. ^ McEvoy, H (1869). The Province of Ontario Gazetteer and Directory. Toronto: Robertson & Cook. pp. 269–271. ISBN 0665094124. Archived from the original on 23 April 2017. https://books.google.ca/books?id=z6wOAAAAYAAJ. ^ not stated (1889). 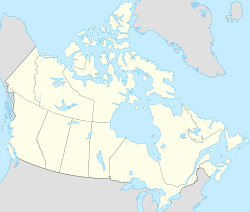 History of the County of Middlesex, Canada. London: W.A. & C.L. Goodspeed. p. 294. Archived from the original on 24 April 2017. https://books.google.ca/books?id=8qsCAAAAMAAJ&printsec=frontcover&dq=History+of+the+County+of+Middlesex,+Canada:+From+the+Earliest+Time+to&hl=en&sa=X&ved=0ahUKEwjoxciA17rTAhUp7IMKHUKZB2oQ6AEIJTAA#v=onepage&q=History%20of%20the%20County%20of%20Middlesex%2C%20Canada%3A%20From%20the%20Earliest%20Time%20to&f=false. ^ "RootsWeb.com Home Page". Archived from the original on 7 April 2016. http://freepages.genealogy.rootsweb.ancestry.com/~theislands/photos6/ansonkeillmilcert.jpg. ^ Moore, Avery (19 December 2013). "Blackfriars Bridge Open To Pedestrians". Blackburn News. Archived from the original on 4 March 2014. https://web.archive.org/web/20140304075243/http://blackburnnews.com/london/2013/12/19/blackfriars-bridge-opens-to-pedestrians/. Retrieved 3 March 2014. ^ "Item 9b". London Advisory Committee on heritage. Archived from the original on 6 July 2011. http://council.london.ca/meetings/Archives/Agendas/Planning%20Committee%20Agendas/Planning%20Committee%20Agendas%202004/2004-08-30%20Agenda/Item%209b.pdf. Retrieved 25 September 2009. ^ Wilson, Robert. "London East". London and Middlesex Historical Society. Archived from the original on 31 January 2009. http://www.londonhistory.org/Londoneast.htm. Retrieved 25 September 2009. ^ "Broughdale Community Association". BCA. Archived from the original on 6 July 2011. https://web.archive.org/web/20110706170147/http://broughdale.ca/. Retrieved 25 September 2009. ^ a b "London, Ontario". Department of National Defence. Archived from the original on 10 June 2011. https://web.archive.org/web/20110610202021/http://www.army.forces.gc.ca/land-terre/units-unites/index-eng.asp?action=City&id=39&rid=267#267. Retrieved 25 September 2009. ^ "History of London – 1977 to 2000". City of London. Archived from the original on 21 January 2015. http://www.london.ca/About-London/london-history/Pages/1977-to-2000.aspx. Retrieved 21 January 2015. ^ Martin, Chip (29 December 2007). "Did Annexation Work?". Special Report (London Free Press). http://webcache.googleusercontent.com/search?q=cache:s9hkV_RIV10J:www.lfpress.ca/cgi-bin/publish.cgi%3Fp%3D220108%26s%3Dsociete+%22did+annexation+work%3F%22&cd=1&hl=en&ct=clnk&gl=ca. ^ "New Directions in Urban Planning". Urban League of London. Archived from the original on 3 December 2009. https://web.archive.org/web/20091203125215/http://www.ul.london.on.ca/urbanweb/Links/UrbanPlanning/index.htm. Retrieved 25 September 2009. ^ "Environmentally Significant Areas". Urban League of London. 2006. Archived from the original on 6 July 2011. https://web.archive.org/web/20110706192355/http://www.ul.london.on.ca/urbanweb/ActiveCitizen/ESA/index.htm. Retrieved 25 September 2009. ^ "Population and dwelling counts, for census metropolitan areas, 2006 and 2001 censuses: 100% data". Statistics Canada. 19 December 2008. Archived from the original on 9 June 2011. http://www12.statcan.gc.ca/census-recensement/2006/dp-pd/hlt/97-550/Index.cfm?TPL=P1C&Page=RETR&LANG=Eng&T=205&SR=1&S=3&O=D&RPP=33. Retrieved 21 October 2009. ^ "Population and dwelling counts, for urban areas, 2006 and 2001 censuses: 100% data". Statistics Canada. 5 November 2008. Archived from the original on 11 February 2009. http://www12.statcan.ca/english/census06/data/popdwell/Table.cfm?T=801&PR=0&SR=1&S=3&O=D. Retrieved 21 October 2009. ^ "Event Highlights for the City of London 1930–1949". City of London. Archived from the original on 18 December 2010. https://web.archive.org/web/20101218012505/http://london.ca/d.aspx?s=%2FAbout_London%2Ftimeline6.htm. Retrieved 25 September 2009. ^ "Historical Flood-Related Events". Environment Canada. 18 February 2009. Archived from the original on 5 November 2010. http://ontario.hazards.ca/historical/Flood_Ontario-e.html. Retrieved 21 October 2009. ^ "Event Highlights for the City of London 1950–1959". City of London. Archived from the original on 18 December 2010. https://web.archive.org/web/20101218012632/http://london.ca/d.aspx?s=%2FAbout_London%2Ftimeline7.htm. Retrieved 25 September 2009. ^ "Event Highlights for the City of London 1980–1989". City of London. Archived from the original on 25 November 2010. https://web.archive.org/web/20101125163523/http://london.ca/d.aspx?s=%2FAbout_London%2Ftimeline.htm. Retrieved 25 September 2009. ^ "Here are 11 other Londons in the world". 1 October 2015. Archived from the original on 6 May 2017. http://metro.co.uk/2015/10/01/11-different-towns-called-london-how-do-they-compare-to-our-capital-5416070/. ^ "Ontario". Historica-Dominion. 2009. Archived from the original on 18 June 2010. http://www.thecanadianencyclopedia.com/index.cfm?Params=A1ARTA0005936&PgNm=TCE. Retrieved 25 September 2009. ^ a b "Your Guide to London's Major Public Parks & Gardens". City of London. Archived from the original on 25 November 2010. https://web.archive.org/web/20101125155504/http://london.ca/d.aspx?s=%2FParks_and_Natural_Areas%2FParks_guide.htm. Retrieved 25 September 2009. ^ "Fanshawe Dam". Upper Thames River Conservation Authority. Archived from the original on 19 August 2009. https://web.archive.org/web/20090819075527/https://www.thamesriver.on.ca/Water_Management/Fanshawe_Dam.htm. Retrieved 25 September 2009. ^ a b c "London INT'L Airport, Ontario". Canadian Climate Normals 1981–2010. Environment Canada. Archived from the original on 18 February 2015. http://climate.weather.gc.ca/climate_normals/results_1981_2010_e.html?stnID=4789&lang=e&dCode=&province=ONT&month1=0&month2=12. Retrieved 22 September 2014. ^ Canada, Government of Canada, Environment and Climate Change. "Environment and Climate Change Canada - Weather and Meteorology - Canada's Top Ten Weather Stories for 2010 - Runner-Up stories". Archived from the original on 18 November 2017. https://ec.gc.ca/meteo-weather/default.asp?lang=En&n=B5187FDA-1#t14. ^ Daniszewski, Hank (7 December 2010). "It's one for the history books". London Free Press. http://www.lfpress.com/news/london/2010/12/07/16460466.html. Retrieved 5 April 2012. ^ a b "August 1918". Canadian Climate Data. Environment Canada. Archived from the original on 9 August 2016. http://climate.weather.gc.ca/climate_data/daily_data_e.html?hlyRange=%7C&dlyRange=1883-03-01%7C1932-01-31&mlyRange=1883-01-01%7C1932-12-01&StationID=4792&Prov=ON&urlExtension=_e.html&searchType=stnName&optLimit=yearRange&StartYear=1840&EndYear=2016&selRowPerPage=25&Line=7&searchMethod=contains&txtStationName=london&timeframe=2&Year=1918&Month=8. Retrieved 21 March 2016. ^ a b "January 1892". Canadian Climate Data. Environment Canada. Archived from the original on 9 August 2016. http://climate.weather.gc.ca/climate_data/daily_data_e.html?hlyRange=%7C&dlyRange=1883-03-01%7C1932-01-31&mlyRange=1883-01-01%7C1932-12-01&StationID=4792&Prov=ON&urlExtension=_e.html&searchType=stnName&optLimit=yearRange&StartYear=1840&EndYear=2016&selRowPerPage=25&Line=7&searchMethod=contains&Month=1&Day=13&txtStationName=london&timeframe=2&Year=1892. Retrieved 21 March 2016. ^ "London INT'L Airport". Canadian Climate Normals 1981–2010. Environment Canada. ftp://ftp.tor.ec.gc.ca/Pub/Normals/English/ONT/ONT_GORE-OTTA_ENG.csv. Retrieved 6 September 2013. ^ "London". Canadian Climate Data. Environment Canada. Archived from the original on 9 August 2016. http://climate.weather.gc.ca/historical_data/search_historic_data_stations_e.html?searchType=stnName&timeframe=1&txtStationName=london&searchMethod=contains&optLimit=yearRange&StartYear=1840&EndYear=1872&Year=2016&Month=6&Day=13&selRowPerPage=25. Retrieved 21 March 2016. ^ "London South". Canadian Climate Data. Environment Canada. Archived from the original on 9 August 2016. http://climate.weather.gc.ca/historical_data/search_historic_data_stations_e.html?searchType=stnName&timeframe=1&txtStationName=london+south&searchMethod=contains&optLimit=yearRange&StartYear=1840&EndYear=2016&Year=2016&Month=6&Day=13&selRowPerPage=25. Retrieved 21 March 2016. ^ "London Lambeth A". Canadian Climate Data. Environment Canada. Archived from the original on 9 August 2016. http://climate.weather.gc.ca/historical_data/search_historic_data_stations_e.html?searchType=stnName&timeframe=1&txtStationName=london+lambeth&searchMethod=contains&optLimit=yearRange&StartYear=1840&EndYear=2016&Year=2016&Month=6&Day=13&selRowPerPage=25. Retrieved 21 March 2016. ^ "March 2012". Canadian Climate Data. Environment Canada. Archived from the original on 9 August 2016. http://climate.weather.gc.ca/climate_data/daily_data_e.html?hlyRange=1994-04-08%7C2016-06-13&dlyRange=2002-09-19%7C2016-06-13&mlyRange=2002-11-01%7C2006-12-01&StationID=10999&Prov=ON&urlExtension=_e.html&searchType=stnName&optLimit=yearRange&StartYear=1840&EndYear=2016&selRowPerPage=25&Line=2&searchMethod=contains&Month=3&Day=13&txtStationName=london&timeframe=2&Year=2012. Retrieved 14 June 2016. ^ "Daily Data Report for February 2017". Canadian Climate Data. Environment Canada. Archived from the original on 26 February 2017. http://climate.weather.gc.ca/climate_data/daily_data_e.html?hlyRange=2012-03-20%7C2017-02-24&dlyRange=2012-03-20%7C2017-02-24&mlyRange=%7C&StationID=50093&Prov=ON&urlExtension=_e.html&searchType=stnProx&optLimit=specDate&Month=2&Day=24&StartYear=1840&EndYear=2017&Year=2017&selRowPerPage=25&Line=0&txtRadius=25&optProxType=navLink&txtLatDecDeg=43.033333333333&txtLongDecDeg=81.15&timeframe=2. Retrieved 25 February 2017. ^ Censuses 1871–1931. Statistics Canada. p. 103. Archived from the original on 19 October 2014. http://www66.statcan.gc.ca/eng/acyb_c1932-eng.aspx?opt=/eng/1932/193201410103_p.%20103.pdf. ^ Census 1941–1951. p. 145. Archived from the original on 9 December 2013. http://www66.statcan.gc.ca/eng/acyb_c1955-eng.aspx?opt=/eng/1955/195501710145_p.%20145.pdf. ^ Census 1961. p. 189. Archived from the original on 23 December 2014. http://www66.statcan.gc.ca/eng/acyb_c1967-eng.aspx?opt=/eng/1967/196702210189_p.%20189.pdf. ^ Censuses 1966, 1971. Archived from the original on 23 December 2014. http://www66.statcan.gc.ca/eng/acyb_c1967-eng.aspx?opt=/eng/1967/196702210189_p.%20189.pdf. ^ Censuses 1981, 1986. p. 192. Archived from the original on 23 December 2014. http://www66.statcan.gc.ca/eng/acyb_c1967-eng.aspx?opt=/eng/1967/196702210189_p.%20189.pdf. ^ "Canada: Ontario". City Population. Archived from the original on 20 January 2012. http://www.citypopulation.de/Canada-Ontario.html. ^ "2006 Community Profiles: London". Statistics Canada. 6 December 2010. Archived from the original on 1 January 2016. http://www12.statcan.gc.ca/census-recensement/2006/dp-pd/prof/92-591/details/Page.cfm?Lang=E&Geo1=CSD&Code1=3539036&Geo2=PR&Code2=35&Data=Count&SearchText=london&SearchType=Begins&SearchPR=01&B1=All&Custom=. Retrieved 22 September 2014. ^ a b "National Household Survey (NHS) Profile, 2011". Statistics Canada. Archived from the original on 8 August 2014. http://www12.statcan.gc.ca/nhs-enm/2011/dp-pd/prof/details/page.cfm?Lang=E&Geo1=CSD&Code1=3539036&Data=Count&SearchText=London&SearchType=Begins&SearchPR=01&A1=All&B1=All&GeoLevel=PR&GeoCode=3539036&TABID=1. Retrieved 22 September 2014. ^ "2006 Community Profiles". Statistics Canada. 2006. Archived from the original on 25 October 2010. http://www12.statcan.ca/census-recensement/2006/dp-pd/prof/92-591/details/Page.cfm?Lang=E&Geo1=CSD&Code1=3539036&Geo2=PR&Code2=35&Data=Count&SearchText=London&SearchType=Begins&SearchPR=01&B1=All&Custom=. Retrieved 24 September 2009. ^ "National Household Survey (NHS) Profile, 2011". Statistics Canada. Archived from the original on 3 July 2013. http://www12.statcan.gc.ca/nhs-enm/2011/dp-pd/prof/details/Page.cfm?Lang=E&Geo1=PR&Code1=35&Data=Count&SearchText=Ontario&SearchType=Begins&SearchPR=01&A1=All&B1=All&GeoLevel=PR&GeoCode=35. Retrieved 26 December 2013. ^ "Table 1- Annual population estimates by census metropolitan area, July 1, 2014". Statistics Canada. Archived from the original on 24 September 2015. http://www.statcan.gc.ca/daily-quotidien/150211/t150211a001-eng.htm. Retrieved 18 August 2015. ^ "London Labour Market Monitor". Service Canada. January 2009. http://www.servicecanada.gc.ca/eng/on/offices/1208lmb/london.shtml. Retrieved 19 July 2009. ^ "LEDC - London Economic Development Corporation" (in en-US). Archived from the original on 25 November 2016. http://www.ledc.com/digital-creative. ^ "LEDC – London Economic Development Corporation". Archived from the original on 18 October 2016. http://www.ledc.com/digital-creative. ^ nurun.com. "The Cube: London's newest digital hothouse". Archived from the original on 18 October 2016. http://www.lfpress.com/2015/12/13/a-throwback-to-the-steam-engine-era-an-old-downtown-industrial-warehouse-is-debuting-anew-for-the-search-engine-era. ^ "LRH Honoured with ACO Award". Archived from the original on 18 October 2016. http://londonroundhouse.com/post/130687606205/lrh-honoured-with-aco-award. ^ "LEDC – London Economic Development Corporation". Archived from the original on 17 October 2016. http://www.ledc.com/resources/business-directory. ^ "Corporate Information: Company Overview". London Life. 2006. Archived from the original on 18 April 2009. http://www.londonlife.com/002/Home/CorporateInformation/CompanyOverview/index.htm. Retrieved 19 July 2009. ^ "Our History". Archived from the original on 31 July 2014. http://www.imperialoil.ca/Canada-English/Imports/history/about_who_history.aspx. Retrieved 22 September 2014. ^ "Introducing the New Libro Credit Union". Libro Credit Union. Archived from the original on 19 March 2015. https://www.libro.ca/Community/About.aspx. Retrieved 22 September 2014. ^ Granger, Alix; Daly, Eric W. (7 February 2006). Canada Trust. Archived from the original on 26 February 2015. http://thecanadianencyclopedia.com/en/article/canada-trust/. Retrieved 22 September 2014. ^ "General Dynamics Awarded $5 Million Contract to Perform Engineering Studies in Support of Mobile Gun System" (Press release). General Dynamics Land Systems. 22 October 2004. Archived from the original on 12 July 2014. http://www.generaldynamics.com/news/press-releases/detail.cfm?customel_dataPageID_1811=9003. Retrieved 22 September 2014. ^ a b De Bono, Norman (30 September 2015). "Union asks NDP to keep Saudi armoured vehicles deal ‘under wraps,’ fearing ‘significant’ job losses". Postmedia Network. Archived from the original on 30 September 2015. http://news.nationalpost.com/news/canada/canadian-politics/union-asks-ndp-to-keep-saudi-armoured-vehicles-deal-under-wraps-fearing-significant-job-losses. Retrieved 30 September 2015. ^ "The Transformation of Galleria London - Reurbanist". Archived from the original on 2 April 2015. http://reurbanist.com/2012/06/the-transformation-of-galleria-london/. ^ "Public library the new home for CBC's digital, radio programming in London, Ont.". CBC News. Archived from the original on 22 November 2016. https://web.archive.org/web/20161122220854/http://www.cbc.ca/news/canada/windsor/london-ontario-cbc-service-1.3836219. ^ DeBono, Norman (16 September 2011). "Ontario Ford plant closure brings tears". Toronto Sun. Québecor Média. Archived from the original on 13 September 2014. https://web.archive.org/web/20140913165947/http://www.torontosun.com/2011/09/16/ontario-ford-plant-closure-brings-tears. Retrieved 22 September 2014. ^ Dubinski, Kate (1 December 2009). "London lands freight centre". London Free Press. Archived from the original on 2 April 2015. https://web.archive.org/web/20150402121317/http://www.lfpress.com/news/london/2009/12/01/11988566-sun.html. Retrieved 22 September 2014. ^ "Ribfest". Family Shows Canada. Archived from the original on 23 April 2009. http://www.festivalsontario.com/. Retrieved 24 September 2009. ^ "Pride London Festival". Pride London Festival. Archived from the original on 2 November 2009. http://www.pridelondon.ca/. Retrieved 24 September 2009. ^ "About Sunfest". Sunfest. Archived from the original on 28 July 2009. http://www.sunfest.on.ca/. Retrieved 24 September 2009. ^ "Home" (in en-US). Archived from the original on 2 February 2017. http://www.londonsymphonia.ca/. ^ "94.9 CHRW – London Music Archive". Archived from the original on 30 November 2016. http://chrwradio.com/lma/. ^ "About Us". Museum London. http://www.londonmuseum.on.ca/d.aspx?s=/About_Us/default.htm. Retrieved 25 September 2009. ^ "Museum of Ontario Archaeology". University of Western Ontario. Archived from the original on 14 July 2009. http://www.uwo.ca/museum/. Retrieved 25 September 2009. ^ "Eldon House Historical Plaque". Archives of Ontario. 2005. Archived from the original on 16 May 2008. https://web.archive.org/web/20080516055329/http://www.ontarioplaques.com/Plaques_MNO/Plaque_Middlesex13.html. Retrieved 24 September 2009. ^ "Sir Frederick G. Banting Square". Canadian Diabetes Association. Archived from the original on 8 April 2009. https://web.archive.org/web/20090408072126/http://www.diabetes.ca/about-us/who/banting-house/banting-square/. Retrieved 25 September 2009. ^ "History of The Palace". Archived from the original on 19 October 2016. http://www.palacetheatre.ca/history-of-the-palace/. ^ "Our History". Archived from the original on 19 October 2016. http://originalkids.ca/our-history.html. ^ "Wordsfest". Archived from the original on 19 October 2016. http://wordsfest.ca/locations. ^ nurun.com. "Scandals aside, London ranks high as place to live". Archived from the original on 19 October 2016. http://www.lfpress.com/2016/06/26/scandals-aside-london-ranks-high-as-place-to-live. ^ nurun.com. "London soars in ranking of best places to live". Archived from the original on 19 October 2016. http://www.lfpress.com/2013/03/20/london-climbs-to-15th-spot-in-annual-moneysense-magazine-ranking. ^ "Canada’s Best Places to Live 2015: Full Ranking" (in en-US). MoneySense. Archived from the original on 19 October 2016. https://web.archive.org/web/20161019150419/http://www.moneysense.ca/canadas-best-places-to-live-2015-full-ranking/. ^ Gilligan, Melissa. "25 happiest cities in Canada". Global News. Archived from the original on 10 August 2016. https://web.archive.org/web/20160810162609/http://globalnews.ca/news/1081134/25-happiest-cities-in-canada/. ^ nurun.com. "The best place to be a woman in Ontario? London". Archived from the original on 19 October 2016. http://www.lfpress.com/2015/07/15/survey-by-canadian-centre-for-policy-alternatives-gives-london-high-marks-as-a-city-for-women. ^ "What is the best and worst city in Canada to be a woman?". CTVNews. Archived from the original on 19 October 2016. https://web.archive.org/web/20161019150145/http://www.ctvnews.ca/canada/what-is-the-best-and-worst-city-in-canada-to-be-a-woman-1.3113113. ^ "Best September EVER | London St. Thomas Association of Realtors". Archived from the original on 19 October 2016. http://www.lstar.ca/news/best-september-ever-0. ^ "Major Parks and Gardens". Archived from the original on 19 October 2016. https://www.london.ca/residents/Parks/Explore-Parks/Pages/Major-Parks-Gardens.aspx. ^ "Thames Valley Parkway". Archived from the original on 19 October 2016. https://www.london.ca/residents/Parks/Explore-Parks/Pages/Thames-Valley-Parkway.aspx. ^ "Best places to retire in Ontario". Archived from the original on 8 May 2017. http://www.comfortlife.ca/blog/best-places-to-retire-in-ontario-10685/#_ftn6. ^ "Canadian Soccer League". 2007. Archived from the original on 1 December 2008. https://web.archive.org/web/20081201111250/http://www.canadiansoccerleague.ca/news_archive.php?news_id=76064. Retrieved 5 April 2012. ^ "Facilities". University of Western Ontario. 2009. Archived from the original on 26 September 2009. http://www.westernmustangs.ca/sports/2009/7/6/GEN_0706090232.aspx?tab=facilities. Retrieved 27 September 2009. ^ "Lethbridge Runners cross the finish line first at the 2008 CCAA Cross Country Running Open". CCAA. June 2009. Archived from the original on 2 April 2015. https://web.archive.org/web/20150402151243/http://www.ccaa.ca/lethbridge-runners-cross-the-finish-line-first-at-the-2008-ccaa-cross-country-running-open-p185913. Retrieved 22 September 2014. ^ "Alberta Runners Top 2010 CCAA Cross Country Running Nationals". CCAA. Archived from the original on 8 March 2012. https://web.archive.org/web/20120308155931/http://www.ccaa.ca/web/index.php/en/cc-news-archive/601-alberta-runners-top-2010-ccaa-cross-country-running-nationals. Retrieved 5 April 2012. ^ "Western Fair Raceway". Western Fair Entertainment Centre. 2006. Archived from the original on 2 September 2009. http://www.westernfair.com/race/home.html. Retrieved 27 September 2009. ^ McLarty, Butch (1 April 2014). "April Baseball at Historic Labatt Park". London Free Press. Archived from the original on 8 August 2014. https://web.archive.org/web/20140808042955/http://www.lfpress.com/ur/story/870615. Retrieved 22 September 2014. ^ "Parks and Recreation Newsletter". City of London. June 2008. Archived from the original on 3 June 2011. https://web.archive.org/web/20110603234324/http://www.london.ca/Sports_and_Recreation/PDFs/2008Newsletter.pdf. Retrieved 27 September 2009. ^ "Attractions". City of London. 2009. Archived from the original on 25 November 2010. https://web.archive.org/web/20101125095911/http://london.ca/d.aspx?s=%2FAttractions%2Fdefault.htm. Retrieved 27 September 2009. ^ "Matt Brown elected as new mayor of London" Script error. CTV London, 27 October 2014. ^ Maloney, Patrick (19 June 2014). "Joe Fontana officially resigns as mayor of London". Toronto Sun. Archived from the original on 27 October 2014. https://web.archive.org/web/20141027211311/http://www.torontosun.com/2014/06/19/joe-fontana-officially-resigns-as-mayor-of-london. Retrieved 22 September 2014. ^ Maloney, Patrick (24 June 2014). "London, Ont. names new mayor to replace Fontana". Toronto Sun. Québecor Média. Archived from the original on 27 October 2014. https://web.archive.org/web/20141027230811/http://www.torontosun.com/2014/06/24/london-ont-names-new-mayor-to-replace-fontana. Retrieved 22 September 2014. ^ "Your December 2006 – November 2010 Council". City of London. 2006. Archived from the original on 25 November 2010. https://web.archive.org/web/20101125123613/http://london.ca/d.aspx?s=%2FCity_Council%2Fdefault.htm. Retrieved 27 September 2009. ^ "Middlesex County Information". Middlesex County. Archived from the original on 5 September 2009. https://web.archive.org/web/20090905035823/http://www.county.middlesex.on.ca/CountyInformation/About_Middlesex.asp. Retrieved 27 September 2009. ^ "London, Ont. votes to become first Canadian city to use ranked ballots - CBC News". Archived from the original on 3 May 2017. http://www.cbc.ca/news/canada/windsor/london-ranked-ballot-1.4095014. ^ "Facilities Accessibility Design Standards (FADS)". City of London Ontario. 2016. Archived from the original on 21 June 2016. https://www.london.ca/city-hall/accessibility/Pages/Facilities-Accessibility-Design-Standards.aspx. Retrieved 20 August 2016. ^ "City of London Official Municipal 2014 Election Results". Archived from the original on 2 April 2015. http://www.london.ca/city-hall/elections/Documents/2014-Election%20Results.pdf. ^ "City Council". Archived from the original on 7 May 2017. https://www.london.ca/city-hall/city-council/pages/default.aspx. ^ "Current MPPs". Legislative Assembly of Ontario. Archived from the original on 29 October 2013. http://www.ontla.on.ca/web/members/members_current.do?locale=en&ord=Riding&dir=ASC&list_type=all_mpps. Retrieved 26 October 2013. ^ "London ridings: Canada Election 2015 results". Archived from the original on 8 January 2017. http://www.cbc.ca/news/canada/kitchener-waterloo/canada-election-2015-london-west-north-centre-fanshawe-elgin-middlesex-1.3278673. ^ "Members of Parliament". Parliament of Canada. Archived from the original on 24 April 2011. http://webinfo.parl.gc.ca/MembersOfParliament/MainMPsCompleteList.aspx?TimePeriod=Current&Language=E. Retrieved 7 June 2011. ^ Suen, Fan-Yee (March 10, 2014). "Serial-Killer Capital of the World? A Look at London, Ont. 's Dark History". CTV News. Archived from the original on 3 May 2017. http://www.ctvnews.ca/canada/serial-killer-capital-of-the-world-a-look-at-london-ont-s-dark-history-1.1721931. ^ "Re-establishing Value". Ontario Professional Planners Institute. Archived from the original on 6 January 2009. http://www.oldeastvillage.com/pdf_reports/Re-establishingValue-aPlanfortheOldEastVillage.pdf. Retrieved 17 July 2009. ^ "Heritage Inventory". City of London. Archived from the original on 25 November 2010. https://web.archive.org/web/20101125182835/http://london.ca/d.aspx?s=%2FHeritage%2FHeritageCitymap.htm. Retrieved 24 September 2009. ^ "London Tourism Information". London Kiosk. 2009. Archived from the original on 20 February 2009. http://www.londonkiosk.ca/london-tourism.php. Retrieved 27 September 2009. ^ Haggarty, Jaclyn (30 September 2008). "Metal Tree Planting Continues". UWO Gazette: p. 1. Archived from the original on 11 June 2011. https://web.archive.org/web/20110611181107/https://www.gazette.uwo.ca/pdf/Gazette-2008-09-30.pdf. Retrieved 21 October 2009. ^ "Getting to London". LEDC. 2006. Archived from the original on 3 May 2008. https://web.archive.org/web/20080503121435/http://goodmovelondon.com/gettingto/. Retrieved 27 September 2009. ^ "Ontario government improving Highway 402 between London and Sarnia". Government of Ontario. 2009. Archived from the original on 30 June 2009. https://web.archive.org/web/20090630002953/http://www.mto.gov.on.ca/english/news/regional/2000/2000-0001.shtml. Retrieved 27 September 2009. ^ Bevers, Cameron (2002). "The King's Highway 403". Archived from the original on 6 March 2010. http://www.thekingshighway.ca/Highway403.htm. Retrieved 27 September 2009. ^ Bevers, Cameron (2002). "The King's Highway 24". Archived from the original on 30 July 2010. http://www.thekingshighway.ca/Highway24.htm. Retrieved 27 September 2009. ^ a b c "Transportation Master Plan". City of London. May 2013. pp. 2–23. Archived from the original on 17 December 2013. http://www.london.ca/city-hall/master-plans-reports/master-plans/Documents/Transportation%20Master%20Plan.pdf. Retrieved 17 December 2013. ^ City of London (2013). "City of London Traffic Volume Data". Archived from the original on 17 December 2013. http://www.london.ca/residents/Roads-Transportation/traffic-management/Pages/Traffic-Volumes.aspx. Retrieved 26 October 2011. ^ "Long-Term Transportation Corridor Protection Study". City of London. Archived from the original on 13 September 2013. https://web.archive.org/web/20130913040755/http://london.ca/d.aspx?s=%2FTransportation%2Fcorridorstudy.htm. Retrieved 17 December 2013. ^ Steeves, Scott (2004). "King's Highway 401 – Images". Archived from the original on 7 August 2007. https://web.archive.org/web/20070807234534/http://onthighways.com/hwy_401_images/Hwy401_p4_images.htm. Retrieved 28 September 2009. ^ "Veterans Memorial Parkway". City of London. 2007. Archived from the original on 17 December 2013. http://www.london.ca/residents/Environment/EAs/Documents/VMP-PicBoard2.pdf. Retrieved 17 December 2013. ^ Adrian Gamble (2016-05-16). "Once Upon a Tram: The London Street Railway Company's 60-year Run in Ontario". Archived from the original on 17 March 2017. https://web.archive.org/web/20170317054816/http://skyrisecities.com/news/2016/05/once-upon-tram-london-street-railway-companys-60-year-run-ontario. Retrieved 2017-03-16. ^ Patrick Maloney (2015-12-06). "It’s back to the transit future". The London Free Press. Archived from the original on 16 March 2017. https://web.archive.org/web/20170316205548/http://www.lfpress.com/2015/12/06/its-back-to-the-transit-future. Retrieved 2017-03-16. "But O’Neil, a local-history buff, has unearthed a document that suggests the proposed rail lines for London’s rapid-transit proposal are perfectly placed. He found a map outlining London’s streetcar lines in 1914, and notes the two lines earmarked today for light rail are where the old trolleys ran a century ago." ^ "Routes and Schedules". London Transit Commission. Archived from the original on 18 September 2009. http://www.ltconline.ca/Routes.htm. Retrieved 19 October 2016. ^ nurun.com. "LTC rolling out big changes". Archived from the original on 19 October 2016. http://www.lfpress.com/2016/08/16/more-hours-new-names-for-routes-coming-next-month-as-overhaul-of-the-london-transit-commission-enters-next-phase. ^ "Timeline". Shift. Archived from the original on 19 October 2016. https://web.archive.org/web/20161019215403/http://www.shiftlondon.ca/timeline. ^ a b "#1: NEW- Updated London ON Bikes Executive Summary | City of London Cycling Master Plan Update". Archived from the original on 19 October 2016. https://web.archive.org/web/20161019212815/https://www.londonbikes.ca/document/1-new-updated-london-bikes-executive-summary. ^ "City Unveils London’s First Ever Bike Corrals and New Fix-it Stations". Archived from the original on 19 October 2016. https://www.london.ca/newsroom/Pages/bike-carrols.aspx. ^ nurun.com. "Cycling plan ready for public test ride". Archived from the original on 20 October 2016. http://www.lfpress.com/2016/09/06/london-bike-path-plan-ready-for-action. ^ a b c "Transportation". London Economic Development Corporation. 2006. Archived from the original on 9 August 2007. https://web.archive.org/web/20070809231730/http://www.londonedc.com/forsiteselectors/infrastructure/transportation/. Retrieved 28 September 2009. ^ "Train routes to/from London". Via Rail. Archived from the original on 4 September 2009. http://www.viarail.ca/en/stations/ontario/london/routes. Retrieved 28 September 2009. ^ "Facts & Figures". Greyhound Canada. Archived from the original on 19 July 2009. http://www.greyhound.ca/HOME/en/About/FactsAndFigures.aspx. Retrieved 28 September 2009. ^ "Airlines and Tour Operators". London International Airport. Archived from the original on 4 March 2011. https://web.archive.org/web/20110304003935/http://www.londonairport.on.ca/airlines.html. Retrieved 19 February 2011. ^ City of London and Giffels (13 December 2007). "Veterans Memorial Parkway Interchange Class Environmental Assessment Study and Concurrent Application to Amend the Official Plan and Zoning By-Law". Archived from the original on 17 December 2013. http://www.london.ca/residents/Environment/EAs/Documents/VMP-PicBoard2.pdf. Retrieved 17 December 2013. ^ a b c "Education". City of London. 2009. Archived from the original on 6 August 2013. https://web.archive.org/web/20130806084408/http://london.ca/d.aspx?s=%2FEducation%2Fdefault.htm. Retrieved 28 September 2009. ^ "Compare academic rankings and ratings of Ontario schools". Archived from the original on 8 January 2014. http://ontario.compareschoolrankings.org/secondary/SchoolsByRankLocationName.aspx. Retrieved 30 November 2013. ^ "About Western". University of Western Ontario. Archived from the original on 9 February 2010. http://communications.uwo.ca/about/waywewere.htm. Retrieved 28 September 2009. ^ Travis, Heather (11 November 2008). "Western 10th in Maclean's ranking". Western News. University of Western Ontario. Archived from the original on 22 December 2009. http://communications.uwo.ca/com/western_news/stories/western_10th_in_maclean%27s_ranking_20081111443145/. Retrieved 28 September 2009. ^ "Global MBA Rankings 2009". Financial Times. 2009. Archived from the original on 20 May 2011. http://rankings.ft.com/businessschoolrankings/global-mba-rankings. Retrieved 24 September 2009. ^ "A University Built for Women by Women". Brescia University College. Archived from the original on 23 April 2009. http://www.brescia.uwo.ca/about/index.html. Retrieved 28 September 2009. ^ Kuntz, Dolores. "About Brescia". Brescia University College. Archived from the original on 2 June 2008. https://web.archive.org/web/20080602183103/http://www.brescia.uwo.ca/about/brescia/history/index.html. Retrieved 28 September 2009. ^ "Historical Information". Huron University College. Archived from the original on 18 June 2008. https://web.archive.org/web/20080618074047/http://www.huronuc.on.ca/about_huron/more_about_huron/historical_information/. Retrieved 28 September 2009. ^ "Quick Facts". King's University College. Archived from the original on 11 August 2010. https://web.archive.org/web/20100811074319/http://www.kings.uwo.ca/about/quick_facts/. Retrieved 5 April 2012. ^ "Western Facts". University of Western Ontario. 2008. Archived from the original on 12 June 2009. http://www.ipb.uwo.ca/facts.php. Retrieved 24 September 2009. ^ a b "Why Fanshawe?". Fanshawe College. Archived from the original on 11 October 2009. https://web.archive.org/web/20091011102418/http://www.fanshawec.ca/EN/counsellors/teachers/why.html. Retrieved 28 September 2009. ^ "Key Performance Indicators". Fanshawe College. Archived from the original on 15 May 2008. https://web.archive.org/web/20080515041321/http://www.fanshawec.ca/EN/kpi/. Retrieved 5 April 2012. ^ "Practical Studio Experience". OIART. http://www.oiart.org/school/. Retrieved 28 September 2009. ^ "Westervelt College". Westervelt College. Archived from the original on 6 September 2013. http://www.westervelt.ca/default.aspx. Retrieved 28 August 2013. ^ Gilbert, Craig (March 14, 2013). "London welcomes delegation from Chinese sister city". OurLondon.ca. Archived from the original on 18 January 2018. https://www.ourlondon.ca/news-story/2505846-london-welcomes-delegation-from-chinese-sister-city/. Retrieved 8 June 2017.